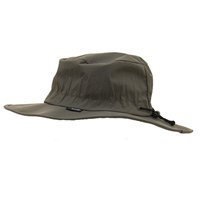 Waterproof rain hats are mainly used during the rainy season to protect people against the rains. There are various types of waterproof raincoats for men that you can decide to acquire and use in case it rains or even during the winter seasons. These rain hats are designed to protect you from the bad weather while ensuring that you are warm and safe from cold. They are also designed in a number of ways to give any person wearing it, that feel of comfort. They are made of waterproof materials that do not allow water to enter of get through to you when you wear them. 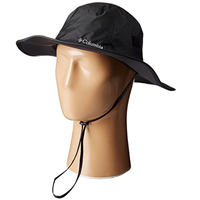 Choosing from quality rain hats would need one to compare different rain hats and come up with one that matches one’s needs. Depending on your needs, you can choose to get a rain hat that is made of a particular material, is lightweight or transparent. This depends on what you are looking for. Some of the waterproof rain Hats for men are described herein. Made from 100-percent microfiber polyester fabric, the waterproof golf hats are uniquely designed with the sporty touch, especially for the golfers. The waterproof hat can be worn during any season, but mostly when it rains since it protects you from the rain while you enjoy playing. It features a unique waterproof with taped seams that are used to keep the rains away from reaching to you. The hat also has a draw-cord, which makes it easy for adjusting the size to a fitting and preferred one. 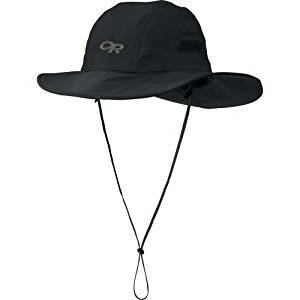 Apart from this, the hat also has a brim that will provide you with protection from the rain or even from the sun whenever you put it on. It is also lightweight and packable, hence appropriate for travel. The Trespass adults waterproof rain hat is made uniquely from polyester material. 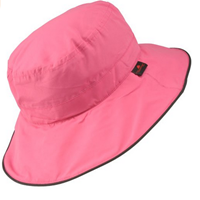 It is a well-designed rain hat with breathable make-up. It is lightweight and easy to carry along since it is packable. The hat is a high performance hat that is created with a large brim and a longer brim at the back, offering it a satisfying outlook when won. 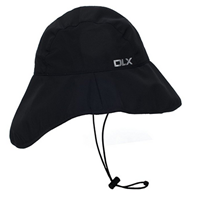 It protects you from the rain and sun since it has a water resistant cover and also has a draw-cord adjuster which can be used to place it in a nice secure fit on the head while worn. 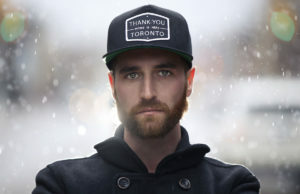 The hat also has a 100-percent polyamide PU lamination and a lining made of polyester, further making it an appropriate outfit for your day. 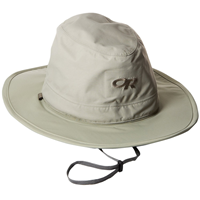 The Frogg Toggs breathable hat is 100-percent waterproof hat made from a classic fabric. Its appealing design gives an amazing outlook when worn. It is totally crushable and can be packed for easy travel hence a reliable travel item. 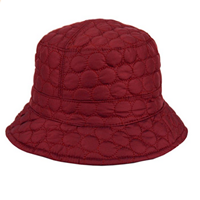 The hat features a short and round brim which accordingly shapes this bucket hat. The hat also has a shock cord tension that is used to adjust the hat to appropriate size which fits any person who wears it. Apart from this, the waterproof material that has been use to design the hat makes it appropriate for wear during the rainy season. 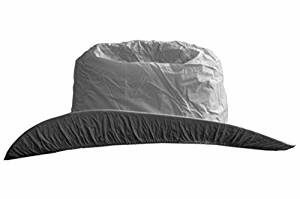 This 100-percent nylon and 100-percent polyester lining hat is a tested product that has passed the test of protecting wearers against heavy downpour whenever worn. 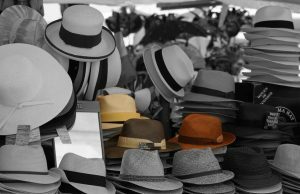 The hat, apart from being made from these wonderful materials, is foam-fitted or stiffened at the brim to make it fit for wear. 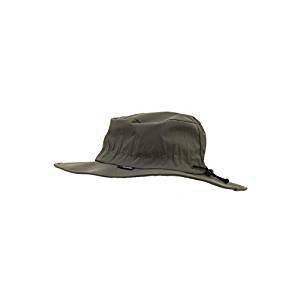 It is a waterproof, breathable and an adventurous hat that keeps you protected against the heavy rains and from the sun too. Another interesting feature of this hat is that it is made of three-layer unique fabric that helps in keeping water away from getting into the hat. It also has a brushed tricot crown which offers comfort and manages moisture. 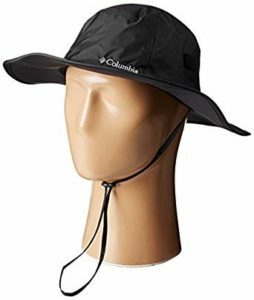 The Colombia watertight booney hat is among the known lightweight and waterproof hat that keeps you protected against bad weather every day, any day. It is a breathable brimmed hat which has been built to protect you from such uncomfortable elements such as rainstorm or sweltering sunshine. 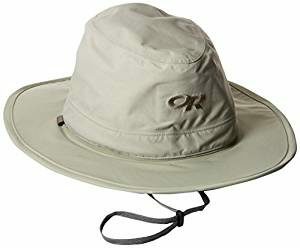 This hat features a fully seam-sealed and nylon material make-over making it unique in the way it is presented to keep it fit for its purpose. It also has a draw-cord and a toggle set at its back to keep it securely fit and adjustable through a chin strap dangling from its side. Designed into different size, the unisex hat rain-cover optimally meets the need to have a good and waterproof to protect you whenever you are out in the rains. This favourite hat features interesting outline and shape which is an admirable first look before we get to even test it. It is made of fine material to keep it fit for use against downpour. The vinyl rain-cover is appropriate for use for outdoor activities and even usable while at home, in office or just around your locality. It is made in a naturally alluring design and style which makes it one of a kind or unique design. 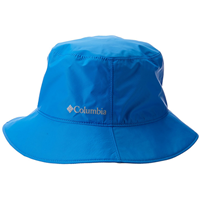 This 100-percent polyester material waterproof rain hat, as it name suggests, is an eminent storm bucket hat designed in a bucket shape to protect you from rains and even sunshine. 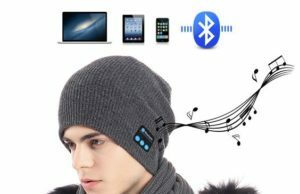 This imported hat is designed in a unique technology to keep it fit for its use. It features an omni-tech waterproof and a breathable fully seam-sealed design which befits it to its accurate function of protecting you against the rains. The hat also is also designed with an omni-wick sweetband and a mesh-lined interior hence a good quality to keep you protected all the time. Its lightweight feature makes it a packable item for travel. 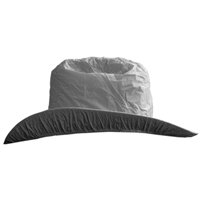 Made out of an exemplary style and rough, solid development, the Ghost Rain Hat gives agreeable, dependable, convertible sun and rain protection all the time. 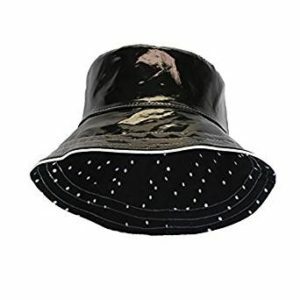 The hat features an amazing style in make-up, giving it unique shape for rain and sun protection. The hat awesomely packs away in a shrouded pocket. At the point when the waterproof GORE-TEX spread is evacuated, the cross section crown takes into account mind blowing ventilation in hot climate while as yet protecting you from cruel UV rays. The hat is a lightweight type of hat which can be easily packed for travel. It is made of a blend of nylon and polyester materials, giving it a further awesome feel. 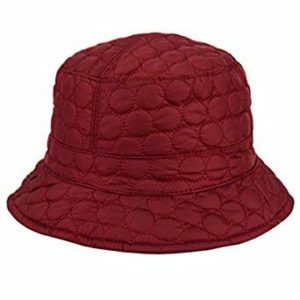 This 100-percent polyester material hat is a cute and well-designed rain hat which will accurately protect you during the winter or any cold and rainy season. It features a quilted waterproof exterior which dries fast when water goes on it. It perfectly fits on the head using adjustable exterior drawstrings well placed on it. 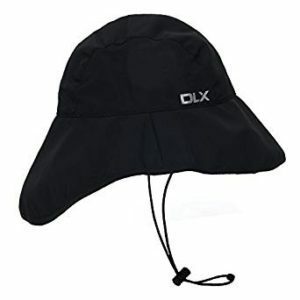 It is also a lightweight rain hat which can easily be packed for travel. Usually, the rain hat comes in different colours which are always findable anytime. Some colours you will get for this are black and grey, hence gives you a wider choice. You deserve to get this. 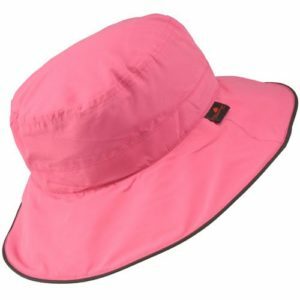 This hot and waterproof stylish hat comes in a range of colours. 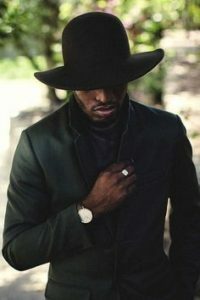 One unique thing with this hat is that it is a reversible hat, meaning that it can be worn on both sides. 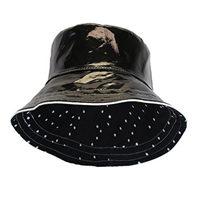 Made of polka dot cotton fabric, the rain hat gives you a waterproof protection. It fits well in most heads and the fact that it is foldable makes it a unique kind of hat which will give you an amazing outlook whenever you are in it. It is also crushable and easy to pack hence a good fit for travel. Apart from these, the hat is also top stitched to give it an amazing exterior outlook with its white piping trim. Usually, it is enjoyable and quite easy enjoying a day out while playing or just taking up some tasks without getting distracted when it rains or because of the hot sun. 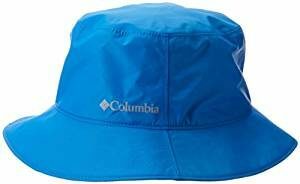 but with a nice and well-designed rain hat, you will get the chance to enjoy your day without fearing a downpour any day, any time.